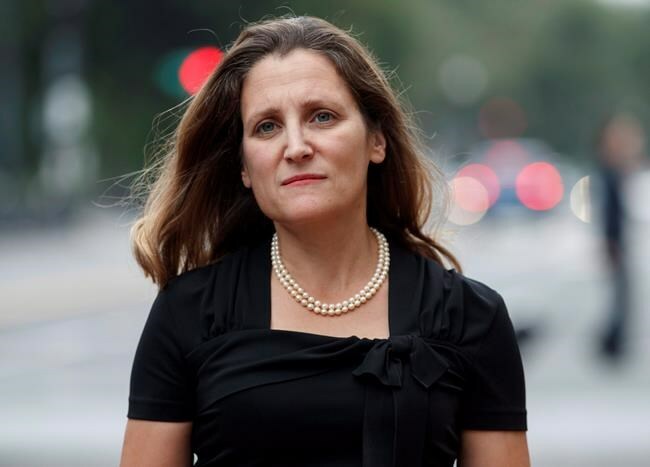 WASHINGTON — Chrystia Freeland was not happy. "She brought them in for that purpose," said one source familiar with the encounter. By all indications, things haven't improved much. Last week, in Washington for a full day of meetings with Lighthizer, Freeland insisted the bilateral negotiations have been "constructive," "productive" and brimming with "goodwill." Kenneth Smith Ramos, Mexico's chief negotiator, seems to be hedging his bets. "Mexico stated from the beginning of the negotiation that the ideal scenario is for NAFTA to remain trilateral," he tweeted Wednesday from Washington, where he was taking part in a legal review of the agreement in principle with the U.S.
"We hope the U.S. and Canada will conclude their bilateral negotiation shortly. If that is not possible we are ready to advance bilaterally with the U.S."
There's confidence in Ottawa that Congress won't approve a deal without Canada. But with a good Mexico-U.S. deal on the table and the clock ticking toward game-changing U.S. midterms in November, that's not a given, warned Dan Ujczo, an Ohio-based trade lawyer with Dickinson Wright. "I think while Congress is generally supportive of Canada, given that Canada is playing defence on a lot of these issues, I don't know how long that will hold," said Ujczo, who is well-versed in NAFTA's nuances. "I envision a scenario where Congress will be very noisy about getting Canada in, but at the end of the day they'll let the U.S.-Mexico deal proceed, so long as the status quo with Canada is maintained while we negotiate." Dairy will be on the lips and minds of many Monday on Parliament Hill, especially given U.S. President Donald Trump's penchant for railing against Canada's supply management system for dairy, poultry and eggs, and the pivotal importance of Quebec — home to nearly half the country's dairy farmers and currently in the throes of a provincial election campaign — to the federal government's own electoral fortunes. One place where supply management hasn't been as hot a topic as advertised? The NAFTA talks themselves, officials suggest. "I don't think it's surprising that they would have been able to come up with a creative solution for dairy," given the degree to which the issue has been "right in the U.S. crosshairs," said Ujczo. Rather, it's dispute resolution that remains the biggest hurdle, insiders say. The U.S. wants to scrap it and allow American courts to judge trade disputes. Mexico has agreed. But Canada is insistent that some form of independent bi-national dispute resolution be part of the deal. All the sound and fury over dairy tariffs and dispute resolution has obscured the patent protection issue, to the potential detriment of Canadian drug consumers, warned Marc-Andre Gagnon, a professor at Ottawa's Carleton University who specializes in pharmaceutical policy. "Right now it's all about supply management and Chapter 19. This is for me another serious issue that could have a huge impact on the cost we are paying for drugs," Gagnon said. "We're just providing wheelbarrows of money to drug companies without getting anything back in return. If you increase intellectual property protection, that does not bring any additional investment to Canada. It just helps foreign companies make more profit." If Canada has already agreed to extend data protection for biologics, that might explain why Ottawa remains confident that Congress — awash in Big Pharma lobbying and campaign contributions — won't proceed without it. "Nobody can really explain to me how Canada's going to get a better deal in a few months from now than they would today," Ujczo said. "I think it's more political than procedural at this point. I can't see the U.S. changing its position on a lot of these areas. Why would it?"